We are delighted to be able to offer a limited number of scholarships to worthy applicants. The scholarship will entitle the holder to a 50% reduction in the fee for their tutor training course – a reduction of £675. The additional £100 deposit (refundable when the tutor begins running training classes) will also be waived. Scholarships are aimed at applicants for Puppy School tutor training who would otherwise, due to financial or other reasons, not be in a position to fund their training. Scholarship applications will be put forward to Head Office by the appropriate Regional Manager following discussion with the applicant. Initial applications should be made in the usual way (online application form – see HERE, followed by interview). Applicants interested in pursuing a scholarship should let their Regional Manager know as soon as possible in the application process. Scholarship applications will be made via an application form which will be provided by the Regional Manager. 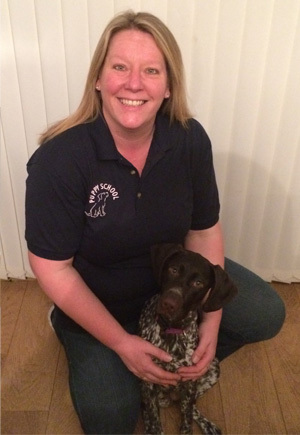 Tammy Dwight lives in Gloucester and has recently undergone training to become a Puppy School tutor, soon to be running puppy classes in the Ledbury area. "I am so excited about the future - becoming part of Puppy School is one of the best things I've ever done. I worked in financial services for 20 years when I was younger, but made the decision to change my life which started by traveling around Australia. When I returned, I set up my own dog walking business and I also co-ordinate a children's charity. These are dream roles for me, albeit less financially rewarding than my previous career. I decided to apply alongside my partner so that we could run classes together. We knew that the costs of undertaking training for both of us would be considerable so I applied for a scholarship. I was thrilled to be accepted as the reduction in fees meant that we would both be able to complete the training. Puppy School offers more than I could have hoped for and I am really looking forward to the next stage of the journey, running my own puppy classes. Thank you, Puppy School, for believing in me." Scholarships are available to new applicants only. Scholarships are only available for tutor applications, not for training to become an assistant to an existing tutor. Puppy School’s decision is final and we are not able to discuss the reason for decisions with individuals. Applicants who are unsuccessful at securing a scholarship may be offered a place on a tutor training course at the full fee of £1,450 (This includes a £100 deposit which will be refunded to you when you run your first class for Puppy School). Unsuccessful applicants wishing to re-apply for the scholarship must wait 12 months before submitting a further application. Scholarship offers are only valid for the next tutor training course and will not necessarily be carried over to future courses should an applicant be unable to attend the given dates.